MM80ERC Measuring Machine Type A Knurled Alu. Wheel. 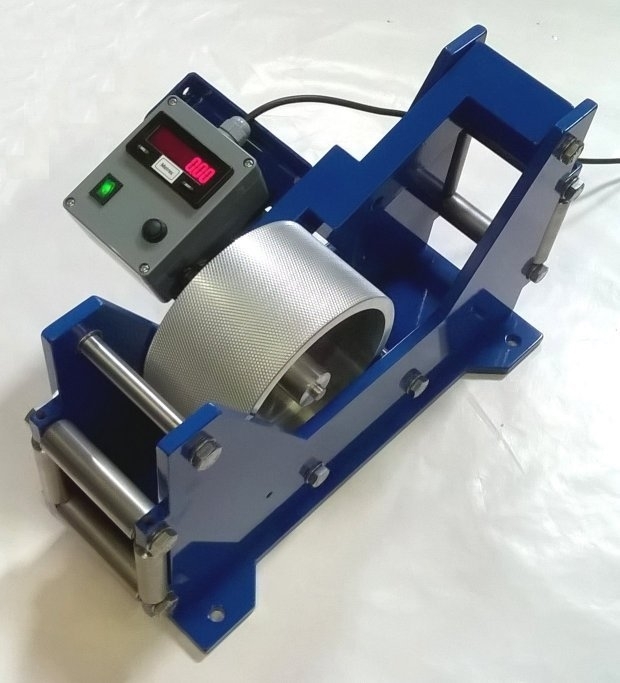 MM80ERC Cable/Wire/Rope Measuring Machine Knurled Alu. Wheel with digital readout. Built of aluminium and stainless steel components, this machine is designed for heavy duty use for cables,rope or hose length measurement. It can measure cable/rope from 5mm up to 80mm in diameter. 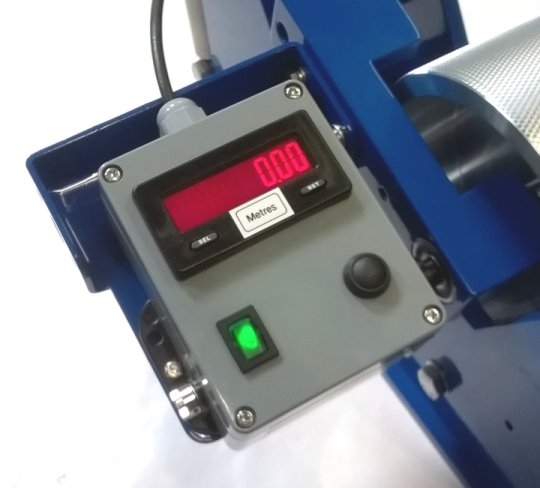 The cable/rope is fed through the machine, a reset button allows the user to zero the count. 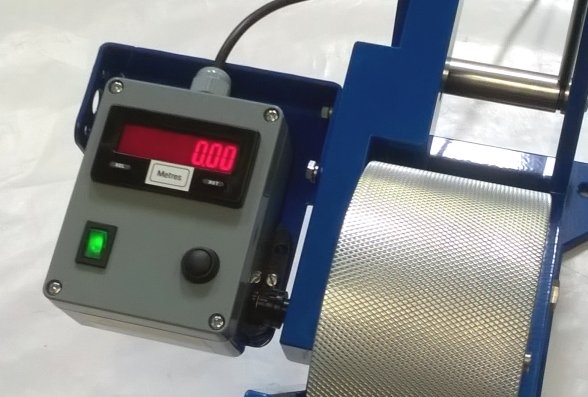 The electronic counter can be used with either a 1/2 metre knurled aluminium measuring wheel or a 1/2 metre polyurethane covered wheel. There are four fixing holes, 350mm apart lengthwise and 150mm apart sideways, they will accept a M10 bolt. The meter displays up to 9999.99 metres. This unit can be calibrated to read Metres/Decimetres/centimetres, Feet, Feet and 10ths, Yards, Yards and 10ths, Inches. Total length 444mm. Width 286.5mm. Height 260mm. Power supply required - 230VAC 1A or a DC version is available on request. A spring mounted tension kit can be added if required, please contact for details. 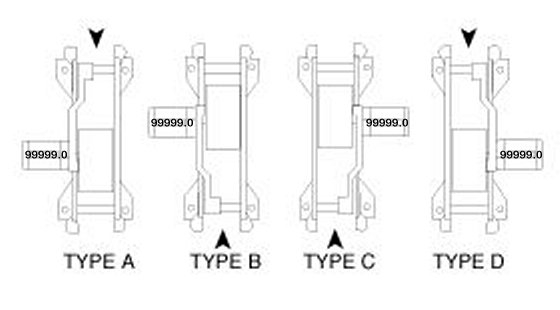 Various different versions are available apart from the type 'A' version listed below depending on what side the operator stands and which way the travel of aterial is, please contact for further assistance for which type is preferable. 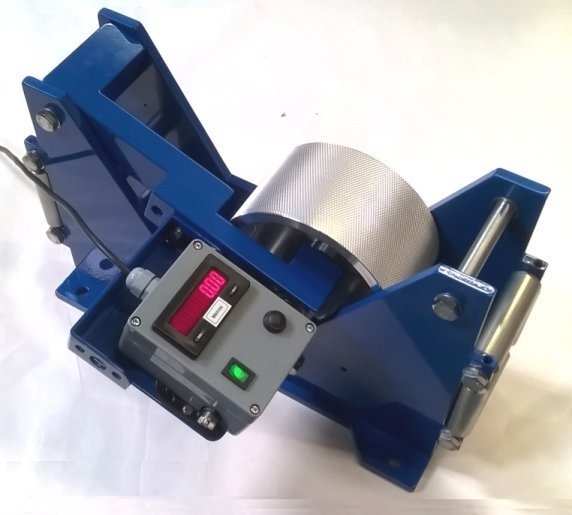 Trumeter 2300-11MCC Mechanical Length Measuring Unit Top Coming TA500AE Top Arm Measuring Machine Ali Wheel Encoder Trumeter 2600-332C Type A Knurled Aluminium Metric Measuring Machine MM80AI Cable/Wire/Rope Imperial Measuring Machine.